From sitting, just sitting here day after day. It's work! How I hate it! If I could find someone to stay on my nest! If I could find someone, I'd fly away--free. . . ."
Ash, When I read this I thought about the documentary of the penquins. Trudging all those miles in the ice and sitting all winter on their eggs. I am sorry you have to be in the situation you are in. You are such a trooper and so is Jono. What a nice husband to keep bringing you toys and being Mr. Mom!! Thank you Daddy Jono, you are awesome!! Dr. Seuss is right up there with Walt Whitman in my favorite poet book. 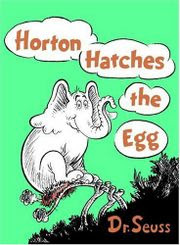 And Horton is one of my favorite characters. Gabriel is only now allowing me to read wordier books like the Horton ones. He's still frustrated that the pictures don't change faster, but now he's starting to sound out the words. You're in our thoughts daily, hoping you're well. Gabriel wanted to know if your bed had a crank (like in the Madeline book).